Could you feel the change Friday night? Did you feel a shift in energy? It caught on the breeze and wafted across Singapore with the scent of soil conducted by a white noise buzz. 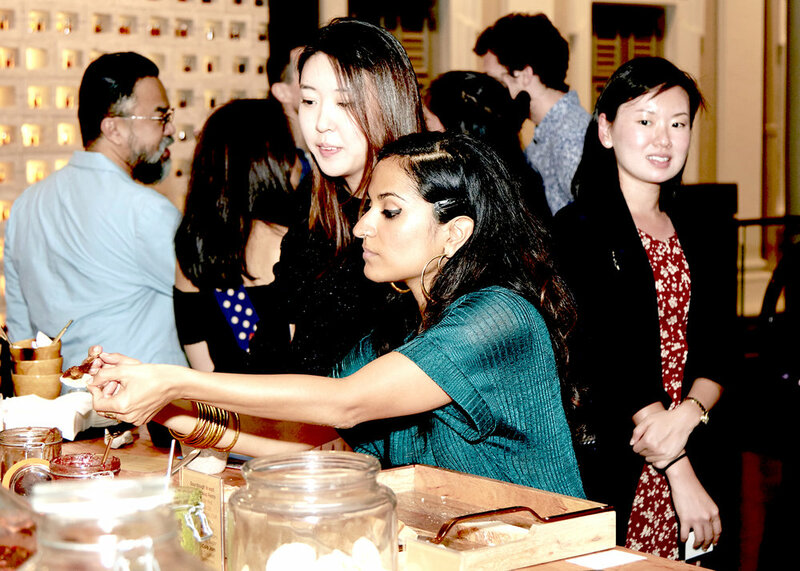 Forming part of the Singapore Art Week 2018 official programme, 'You Art What You Eat', on Saturday 20th January, brought artists, restauranteurs, and culture and lifestyle professionals together, to connect and be inspired. The artist Mamakan will be sharing the inspiration behind her art, through the story of Nathaniel Wallich, a pioneer naturalist from the early colonial days of South and Southeast Asia. Six leading minds from diverse creative fields presented their work and thoughts: Joshua Judd (Director at SRSS Interior Design), Robbyn Carter (Project Director at HBA), Aldwin Ong (Design Director and Principal at Wilson Associates), Tan Lun Cheak (Studio Director at Kohler Asia Pacific), designer Olivia Lee and artist Mamakan. Join our band of young eco-warriors to defend edible plants in Fort Canning Park from a greedy general! The game plan: we hunt, taste and smell plants such as the sour apple, wild pepper, hibiscus and blue pea flowers*. Finish off with an exciting trivia game and a homemade snack to celebrate our successful defence of Mother Nature. Tickets: $28 per player, includes educational game booklet, tastings and a snack. Notes* Edible plants are prepared for safe consumption and children are supervised at all times during the game. Recommended age is 7 years and above. Invited by Xyntéo, a sustainability advisory company headquartered in Oslo, Mamakan was asked to create an art/food experience for The Performance Theatre, an annual meeting of thinkers, influencers and doers united by a shared commitment to reinventing our growth model. Held in a different city each year, it provides a 36-hour space for leaders to learn, explore, reflect and question accepted wisdom. In 2017, TPT was held in Singapore on June 16-17. The theme for 2017 was “Invisible Realities”. Across the world, there is a mounting sense of deep estrangement in many quarters – between citizen and leader, work and purpose, and even from ourselves. How do we connect to those who we struggle to see, let alone understand? Spend an afternoon indulging your senses and be taken on a culinary art journey based on the highly successful “GastroGeography” exhibitions. The Mamakan Art Collective will inspire you to get creatively in touch with nature, tasting your way through local botanical treasures and rediscovering part of Singapore’s forgotten food heritage. The Artist Lecture will feature an 8-course taster menu, each accompanied with a new story. Travel back to Singapore in the 1400’s with cocktails ranging from Bathing Princess on the Hill, a purple liqueur made from Fort Canning flowers, to the explosion of flavours in the SpiceBomb of Diversity, a daring futuristic infusion of native spices. Book early as tables are limited. Notes: All taster items are vegetarian, gluten-free, and free of pesticides. Virgin cocktails (non-alcoholic) are available by request. Saturday 18 February | 3-5pm. Registration from 2.45-3pm.